Stylish Star Allu Arjun's film with Trivikram Srinivas has finally been confirmed and the official announcement was made on New Year's Eve. 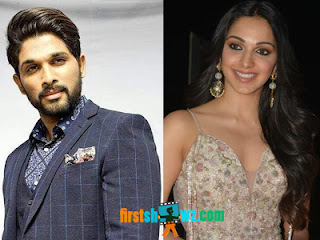 The latest buzz is that Allu Arjun romances Kiara Advani in this commercial entertainer. The cast and crew of Bunny – Trivikram project are being finalized and it's being produced on Haarika and Hassine Creations banner in collaboration with Geeta Arts production. Allu Arjun, Trivikram movie is most anticipated film since the combo earlier delivered super hits in the form of ‘Julayi’ and ‘S/o Satyamurthy’. This will be first time Allu Arjun romances Kiara Advani, and she was earlier seen in Mahesh Babu’s ‘Barath Ane Nenu’. Kiara is also part of ‘Vinaya Vidheya Rama’ taking shape in Boyapati Srinu direction casting Ram Charan as the lead. The regular shooting schedules will begin soon.